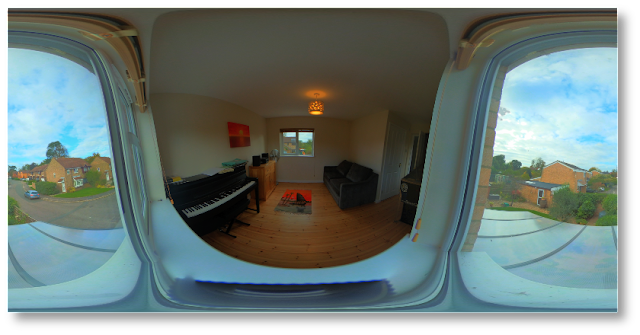 Capturing 360 degree photos with the MiSphere 360 is very easy to do - the camera is just point-and-shoot, and the software on your mobile phone does all the rest. However, if you wish to do some more clever things, such as generate high dynamic range images, the software is lacking. This note shows how to take bracketted photos with the camera, and merge them together into a single image and convert to a rectilinear photograph. 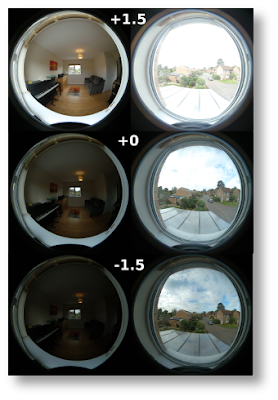 The following images are examples taken out of a window such that the inside is dark and outside is too bright. These images will be used for the example in this post. Transfer these to a PC. 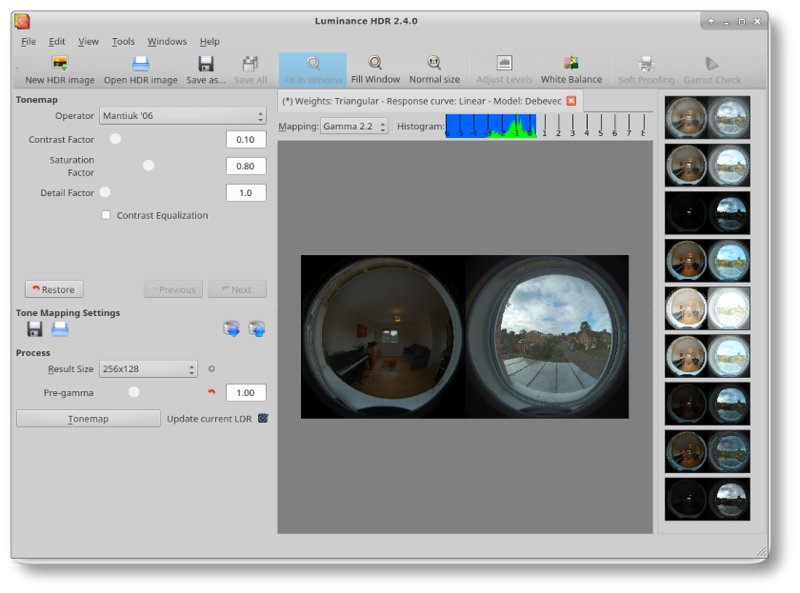 Use Luminance HDR to generate a HDR image. Load the three images into Luminance HDR. 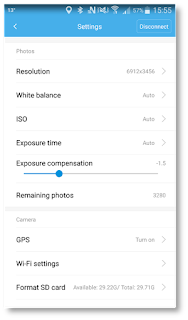 The exposure compensation should be automatically detected, but if not, assign the +1.5 to the brightest, and -1.5 to the darkest of the three images. Select next, and use the default profile to continue. 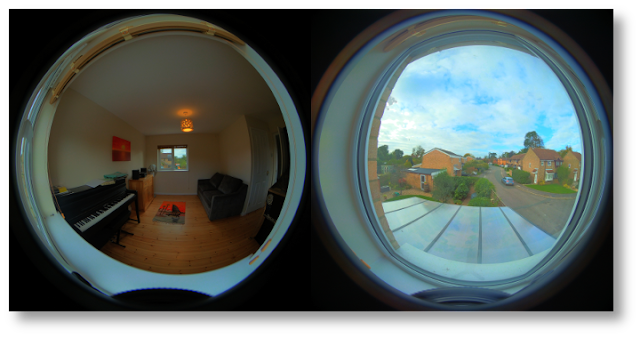 You will then be presented with the Luminance HDR main window. There are several different Tonemap operators you can select. The Result size by default is tiny (256 x 128 in this example). 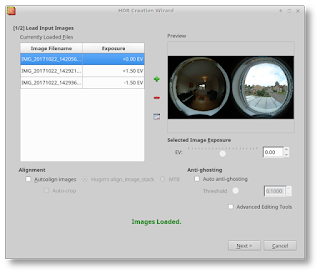 Start by selecting a result size of 6912 x 3456 (the same as the input image size). Then, pick an image on the right that you think may be close to what you want. When you've got something you like, hit Save As, and your image will be saved as a jpg. Pick 100% (i.e. no compression) when you save. You may think that at this point, you can run the Mi Sphere Camera Windows program under Wine (it does work, by the way). Unfortunately, it refuses to process images that have been tampered with since they left the camera. For this, you can make use of a project file. There are several available - I used the one available from: http://ez-team.com/xiaomi.html. Copy the pto file into a directory, and open it with Hugin. It will prompt you for the file, so navigate to the jpg/tif file that was output from Luminance HDR. I choose the advanced option, and then select Advanced Mode, and then, in the panorama preview, you can centre the image, and level the horizon. 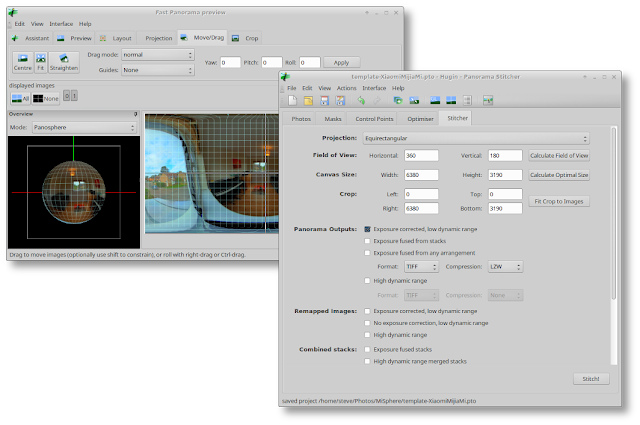 Then, in the Panorama Stitcher, you can Calculate the Optimal size, and stitch - this will give you a rectilinear output image. Once you have your image, you will probably want to share it. One way is with Panellum, which is covered in my other Hugin post. This blog entry shows how to set up a local development environment for the Amazon Echo. It doesn't provide information on how to write echo skills (that's reserved for other blog entries!). This assumes that you've already got an echo, and have already got an Amazon account set up. Expand the first entry (regarding root keys), and select Manage Security Credentials. 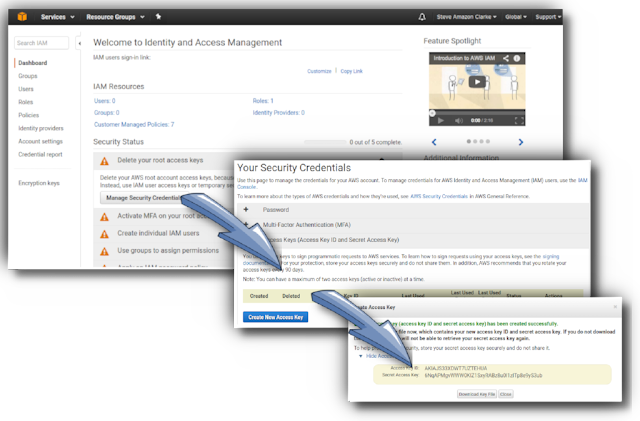 In the Security Credentials, Create a New Access Key. Either download the access key information, or leave this dialog box open so hat you can use the information later. Note that you don't need to create any Keys (other parts of the IAM security pages). Creating other keys will cause you to be invoiced for them!!! Configure your AWS environment, using the access key and secret you previously created in the IAM console online. MODULES="`grep require *.js | grep -v \\./ | sed -e s/\\"/\\'/g | cut -d\\' -f2`"
echo "Valid Events: `ls *.json | sed -e 's/.json//g'`"
lambda-local -p ~/.aws/credentials -l js -e "test/$1.json"
Make sure your test json files have a userId defined, otherwise scripts that use dynamoDB will fail to run, because your scripts will use the access key to access your online dynamoDB database. If you get errors when running the upload script, that state that 'aws lambda' is not recognised, it is possible that you've got an old version of the aws program installed. Try 'aws -v' or 'aws --version'. Places to look are /usr/local/bin and /usr/bin. At the moment, if you have several uses in the household and you want separate functions e.g. diaries or music collections, you have to switch household user accounts which is quiet cumbersome. There is work going on in recognising individuals voices but i think there is a much simpler idea ... Using different wake words. So i can say "alexa what's going on today"
And my partner can say "john what's going on today"
And there is enough information to direct the search to the correct diary. I suspect this idea is patentable but I've not the time to go through the process and would really appreciate the feature. So the best way for me is to put it in the public domain for anyone to use. "The remote endpoint could not be called, or the response it returned was invalid." There are many causes for this, some of which are far from obvious. 1. The skill cannot be contacted. Check the Service Endpoint Type and Endpoint in the Configuration in the Amazon Developer Console correctly point to a skill (either on a https server, or on, for example, the EU Amazon AWS Server). This works fine when running on the AWS Server, but fails with the dreaded 'endpoint' error. If you don't have anything useful to put in the "card", don't add the entry at all to the response. I captured the real output of an echo (see next section), and submitted it as a JSON input in the Service Simulator. I had to manually add in the "attributes" line to make the simulator work correctly. This code did, however, work in the AWS Lambda test environment. The spelling of the code is in American, not English. Note that the AudioPlayer.Play is Behavior, not Behaviour! Use the service simulator in the developer console, then copy the JSON request, and paste it into the 'Actions / Configure Test Event' on the Lambda server. This way, you may see the cause of the error. Ask your Echo to launch the skill (using whatever utterance you need to test the appropriate function). Now, launch the CloudWatch (link to EU Server), and look at the latest log entry. You can then see the actual request from the Echo. You can paste this request into the 'Actions / Configure Test Event' on the Lambda server, or into the JSON input in the Amazon Developer simulator. You will notice that the Simulator and the Echo sometimes give differently formatted requests! Firstly, create the users and groups, and when you do, make sure that the passwords are fiendishly complicated (once you've finished, you'll only need these to set up new connections). Edit the groups, and ensure that the users are in the correct groups, and pi is removed from all. Enter the long password (for the last time). If you wish to use the wired interface, simply plug it in. It is recommended to set this up using your modem DHCP to bind the MAC address to a static IP address. The Pi is now configured. The Amazon Echo is a great piece of kit, which is flexible and can be expanded with the use of skills. These skills are initially difficult to get your head around, but once you've managed one, they become easy to produce. This note takes you through the steps taken to get an internet radio station to be played on an Echo. Including developing the skill, setting up an encrypted link, and implementing a relay to a non-supported radio station or stream. "Alexa, ask flintstone film what is the name of the main character"
The Echo will only connect to servers that it can obtain trusted certificates for, which means that the connections must be 'https', and the remote server must have signed certificates from a recognised authority for the Echo to connect. If the Echo is asked to connect to a site without the appropriate certification, no response may result. On first look, this seems to be Amazon's effort to stop you writing functions such as playing music from your own media server (i.e. having to buy Amazon's services instead). However, it does have some significant advantages, in that the Echo is not able (by protocol) to go snooping around inside your house because devices in your house are note accessible on the internet, and do not have the right certificates. Unfortunately, the majority of internet radio stations do not operate over 'https' with appropriately signed certificates. The built-in TuneIn app either has some code which allows it to bypass this function, or TuneIn have a number of relays and will forward http based stations over a https connection. I've not configured the echo to sniff the packets to determine which is is doing - if anyone has found out which, a comment would be great! For me, the radio station I like to listen to is "IP Music Slow", which is based in Switzerland. Unfortunately, TuneIn no longer works with this station, and tries to play "KP4IP" any time I request my station. The TuneIn app is actually capable of playing "IP Music Slow" (if I select the station from the history in the web browser control panel, from a time when it did work), but if the speech recognition picks the wrong station, this is of very little use. So, to stream your own station, it is necessary to build a http to https relay. This method can also be applied to a media server (i.e. attach an ice-cast server to a UPNP media server, and forward the tracks as a radio stream). The system I've set up uses a Raspberry PI, which is accessible on the internet via a https link, and various pieces of software to allow it to be recognised and used as a relay. Note that Amazon allow you to use a development configuration, where the certificate trust can be uploaded, and a root CA is not required, however, this note demonstrates a way of doing it 'properly'. Welcome to the trumpton blog. I use this blog to record interesting things, but mainly use it to provide an extension to my failing memory. In the blog, you will find lessons I have learned, in areas from paragliding to washing machine repair, internet radios and linux installations. Please use the menu bar at the top of the screen or the search and navigation menu to the right. Copyright (c) Steve Clarke. Picture Window theme. Powered by Blogger.